It seems lately that whenever the Ravens play the Jets, they see some familiar faces. There is odd history in this since 2009. Back in 2008, when the Ravens were following up a 5-11 season into the new year, they needed a new head coach to replace Brian Billick. Our defensive coordinator, Rex Ryan, had been preparing for this day for a long time. However, our guys surprised everyone by appointing the mostly unknown Eagles coordinator John Harbaugh. The person most surprised (and a little hurt) was Rex Ryan. He played out as defensive coordinator one year under Harbaugh until taking a head coach vacancy in New York. He went up there to establish a new atmosphere, full of assurance, swagger, and attitude. He has been joined by several former Ravens defenders during his tenure, the most notable one being linebacker Bart Scott. Scott was an undrafted linebacker who eventually made his way into the Ravens’ starting lineup. He became a high price acquisition for the Jets. There are others of course. After filling in a vacancy for a single season on the Ravens, a safety by the name of Jim Leonhard joined the Jets for a few seasons. Another safety the Ravens had for a while, Dawan Landry, is now currently a Jets starter. Some other non safeties, like Trevor Pryce and Marques Douglas, have also spent some time with the 2009-Present Jets directly following time on the Ravens squad. One more former Raven, then Jet player, to bring up is good ol’ Derrick Mason. Now he is a very interesting parallel to this upcoming game. This is because, back in 2011, Mason signed with the Jets after spending 5 seasons with Baltimore, and was obtained by the Texans that same year. Here’s where it gets interesting: if you recall, we played against the Jets that year in a 34-17 win. What you may not remember is that the Ravens also played the Texans that year (who had Mason for this game as well), this time with a 29-14 win. Both of these games happened at M&T Bank Stadium. Both of these were separated by a week 5 bye for the Ravens. What, you may ask, has this to do with this game? Well, in week 3 this year, we beat the Texans 30-9 at home. As little as two weeks ago, our good ol’ Ed Reed was cut by the Texans and signed on with the Jets. Now he gets to face the Ravens again at home. So for the 2nd year in 3 years, we have a situation in which a former well-liked player manages to face off against the Ravens at home twice on two different teams. Both times are with the Jets and Texans! As far as Reed is concerned, this may be his last year as he is 35 years old. Thankfully, he is keeping his options open to possibly coach for the Ravens in the future. But this Sunday, it’s all about beating the Jets. We may have a helping hand on offense this week as Dennis Pitta looks prepared to rejoin the team and give Flacco a much needed security blanket. 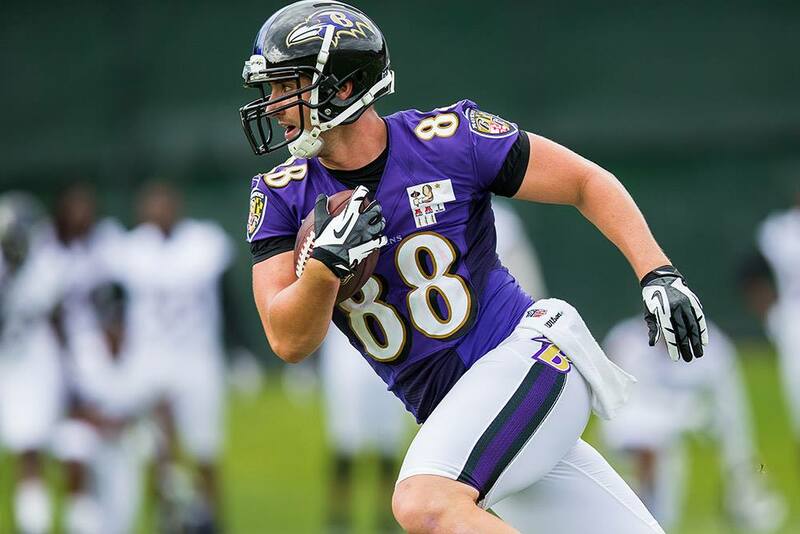 From Shannon Sharpe to Todd Heap to Dennis Pitta, the offense can only do better when the first string tight end is healthy. What the Ravens need is a reliable set of hands for 7-10 yard & end zone catches, and that’s what Pitta brings to the table. This game (1:00pm CBS) will sure to be a great one! If you’re going to the game, temperatures will be in the mid 30s, so dress warm! Good luck and go Ravens! Photo credit to Baltimore Ravens on Facebook.